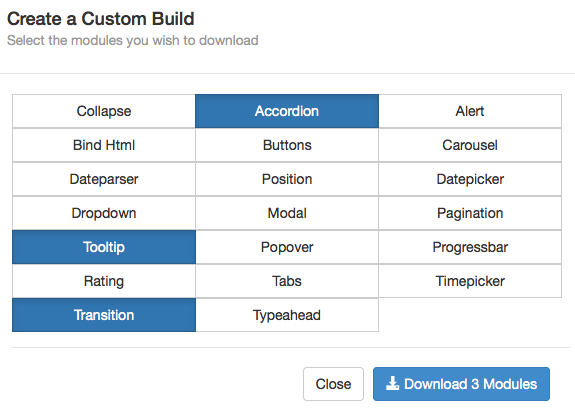 I'm using the accordion, tooltips and transition components of UI Bootstrap. I can create a custom build with the online tool on the UI Bootstrap website, which will create a minified and non-minified JS file containing only the components I selected, without overhead. However, I don't want to use the online tool to compile my custom version of UI Bootstrap, instead I want to compile my own version locally, preferably using the tools I already use; Bower, Grunt and NPM. So my question: How can I create my own version of UI Bootstrap locally? bower install angular-ui-bootstrap, and then calling Grunt build in bower_components/angular-ui-bootstrap creates a UI Bootstrap build that includes all modules, there's probably a way to do the same with only a subset of the modules, but I could not figure this out. Is grunt.file.write(…) synchronous or asynchronous? How to use dynamic values in Grunt tasks called from inside a forEach? How do I create a deploy git branch for my Yeoman project? Stop Angular UI bootstrap dropdown from closing in certain cases? Does an existing gruntfile need to be edited? What is the common workflow? For an existing app, is there a proper protocol for specifying bower packages such that they're handled correctly when running "grunt build"? Does an existing gruntfile need to be edited? What is the common workflow?